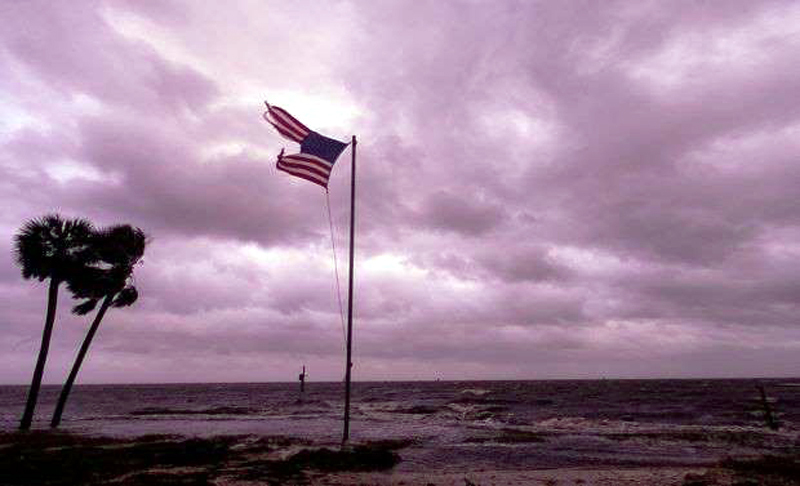 America the Beautiful sings of "purple mountain majesties," but after deadly Hurricane Michael passed through Florida's panhandle, it was the skies that turned an eerie purple. Florida Gov. Rick Scott called the hurricane an "absolute monster." As of Thursday night, CNET sister site CBS News reported that at least six people died when the Category 4 hurricane, now downgraded to a tropical storm, made landfall on Florida's Gulf Coast on Wednesday. But even after the hurricane had moved on, its weather pattern affected the Florida skies. Reporters and residents shared images of post-storm skies ranging from a light lavender to a deep violet, and it turns out there's a scientific explanation for the unusual hues. There was enough interest in the purple palette that Florida-based First Coast News produced a short video of meteorologist Lauren Rautenkranz explaining the science behind it, noting that we normally see blue skies because blue wins out in a sort of scientific battle with violet. "As sunlight shines down to Earth, most of the colors of the spectrum are able to reach the surface uninterrupted," Rautenkranz said in the video. "But the shorter wavelengths, blue and violet, are scattered in every direction. This light bounces from particle to particle until it eventually reaches your eyes. But the sky doesn't appear violet and blue because of our eyes' limitations." Normally, she said, our eyes can only detect blue, because violet is the shortest wavelength of the color spectrum. But after the hurricane, the conditions were right for purple to make an appearance. The air was super-saturated, dew points were in the mid- and upper 70s, the sun was setting, and the hurricane's clouds hung low to the ground. "This combination allowed our eyes to see (the sky's) true since violet is there begin with, we just don't usually get to see it," Rautenkrantz said. "The light was scattered around the moisture in the air, causing the magical purple color." The weather phenomenon brought some beauty to the destructive storm. "The color of the sky was beautiful," Tracy Walker tweeted in response to the video. "I wish that we could see that more often, minus the hurricane of course!" But not everyone saw it as newsworthy. "Why did everyone put the purple sky on their story, like I can't walk outside and look up?" wrote one Twitter user.